The Fourth Southbroom Mixed Classic presented by Pharaohs Construction was a wonderful event. We had 104, a beautiful golf course and fantastic sponsors. Judging from all the happy feedback, the Southbroom Mixed Classic was certainly enjoyed by all. What a wonderful Pharaoh Construction Mixed Classic we had at Southbroom this last week end . The weather was a little dodgy blowing hard from the north on Saturday, then hard from the south on Sunday which just added to the challenge of Mixed Golf. 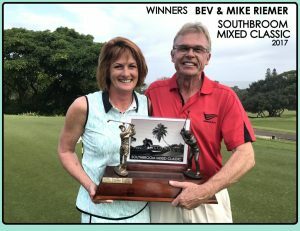 Mike and Bev Reiner made 80 points over the two days, finishing one shot ahead of Brian and Lynne Blackstock. Jeanette Peyios and I played with Brian and Lynne on Sunday and they played some special golf in the wind. We finished 4th behind Derrik and Rene Matthew on 77 points. Both evenings entertainment was fantastic with our Southbroom Legends band of Mel Davies, Josh Pretorius, Des Erasmus and new man on the block- Dion de Beer, all playing some great catchy country music Winston Smile was as good as always on Saturday night and the dance floor was never empty. The food was voted absolutely delicious, there was plenty of laughter, fun, great outfits! dancing and plenty to drink. Thanks to our local Décor Ladies Mari Fielden & Sandy Luus for transforming the club house and bar into the Country and Western Theme. Thanks to all our wonderful sponsors and to the players who travelled from all over the country to enjoy the Mixed Classic. We look forward to next year The Tournament pics can all be found on facebook Click Here!